If you're asking me, zombies have had all the bad PR. Sure, they look ugly as hell and you can probably smell them coming a mile away, but being dead kind of does that to you. But what is the constant reminder that zombies are supposed to be braindead about? I mean, look at skeletons, they've got air for brains, surely that must be a far greater inconvenience then a few worms wiggling their way through your cerebral tissue? But anyway, I'm trailing off. 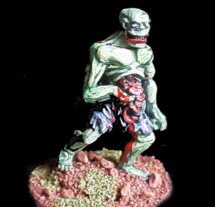 What you have here before you is the Zombie Showcase, a tribute to all things rotten in the 28-or-thereabout-mm-scale. 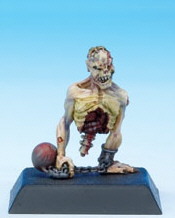 The renowned French manufacturer of Confrontation figures has ventured in the world of rotting flesh and bad breath. And as always, they do it with style and and, in this case, the right amount of gore. The highlight of what they have to offer, is this splendid model of a charming fellow who's decomposing in more than one sense. I'm not sure whether you get two miniatures for the price of one or just one for the price of two. But this is Rackham, so who cares. Only available from Rackham directly. French manufacturer of a large range of unusual resin miniatures. The material, resin, is more brittle than you'll be used to and makes the minis a bit delicate, but also allows to cram in all sorts of fine detail you just can't get with metal. Although many of their minis look a bit strange when you look a the pictures, the unpainted ones will often surprise you when you see them in the flesh (resin). The site just doesn't do them justice. They have 3 packs of 3 zombies (codes FM06, FM22, FM41)and one Zombie Troll (not shown). 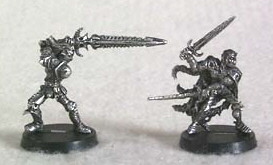 I-Kore manufactures and distributes fantasy miniatures for the Celtos game. 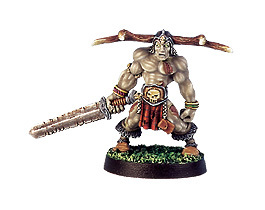 Their undead figures are called the Fir Bolg and count more than one zombie among their ranks. The first of the lot is a special character called Mordred "The Damned", whose healthy complexion leaves no doubt as to his condition. 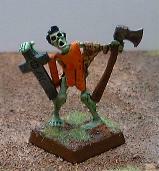 He does not come alone however and next up are some decent rank & file handweapon zombies and zombie spearmen (2 sets). The putrification process seems to be in the early stages and although battlescarred, their skin tissue seems more or less intact. These are the newly dead and when compared to their older kin, they are relatively fresh. The company that now owns Warzone and Chronopia, the latter being another source for zombie miniatures. 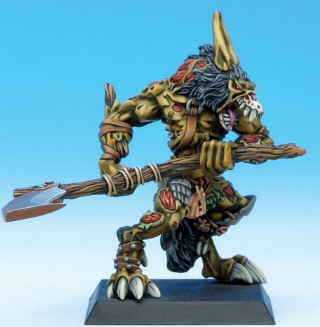 Chronopia miniatures are in general well sculpted miniatures and come with round slotted bases. Their stuff is a bit less generic than some other companies but well worth checking out. 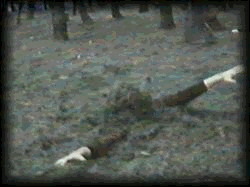 The zombies in this range are comparable to the i-Kore ones, with a minimum of gore. The line to look for would normally be the "Devout", which are somewhat of a cross between chaos and undead armies. You won't find the zombies there however. For some reason those are part of the "Sons of Kronos" (barbarians) army. They are simply called "the unliving" but they're clearly a type of zombies. Aka Icon Miniatures aka Harlequin Miniatures. One day the founding fathers of this company must have woken up and said: "If you can't beat them, join them." Or at the very least imitate them as best you can, but at lower cost. Their ranges went to a great deal of effort to closely mirror those of that other giant of fantasy miniatures that will remain nameless for the purpose of this showcase. Given this strategy, there were bound to be some zombies in the range. 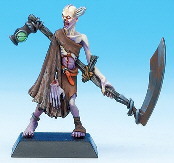 The first source for zombies from Black Tree is the "Fantasy Armies" range. 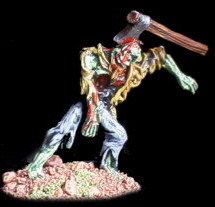 These are generic zombies with a variety of handweapons and very little clothing or armour. These are okay, but not fantastic and come with slotted bases. 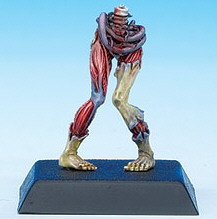 More zombies can be found in the "Harlequin Fantasy" range. These are wearing remnants of military equipment, with some scraps of (probably rusty) armour. Basically they look like medieval footsoldiers. But zombies. Some have handweapons, other carry twohanded weapons, spears, halberds or even crossbows. 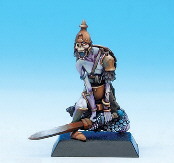 The old Grenadier "Fantasy Warrior" range, distributed for a while by Nemo miniatures, to be re-re-released in the near future by eM-4 Miniatures, includes models for an undead army. And if you see "undead", then what do you think? Well, mostly skeletons, I guess... But zombies too! 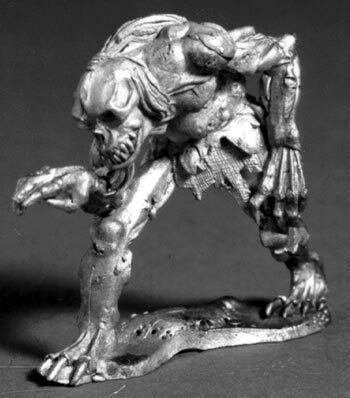 Mostly known, for their smaller scale hordes, Kallistra also manufactures some 28mm figures: High Elves, Wood Elves, Orcs, Pygmies and, last but not least, Zombies. These are the "raised from the grave"-type of zombies and some of them still carry their tombstone around. For sentimental reasons or just to smack you over the head with, who knows what goes on in those decomposing brains of theirs? Look under "The Lich Masters" for zombie slaves and "Demons of Darkness" for an 'undead troll' (picture) and a 'plague troll'. If you're looking for other undead allies to fight alongside or to command your zombies, then take a look at the excellent All Things Bony, Tombs of the Pharoahs and All Things Bloody showcases. If you want to use these minis in the excellent "Zombies" boardgames, take a look at our very own UnclEvl's optional rules.